As of Saturday September 4, 2010 we have not picked a single grape. This is a good thing because we will be busy bottling our 2009 Pinot Noir, 2007 Cabernet Franc, and 2008 Zinfandel next Tuesday. After last weeks blistering 3 days of 112 F the weather prediction is a return to below average temps. 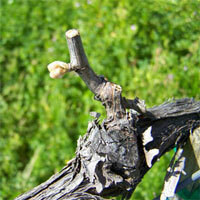 This gives a chance to thin some of the burned clusters and allow the vineyards to “Rehydrate”. More hang time for the Grapes means better wine for us all. The September Club Shipment is our wonderful 2004 Napa Valley Cabernet Sauvignon. To our club members and special guests, call ahead to make arrangements for our VIP group treatment. Barrel tastings, food pairings and more can be arranged by request. Our hospitality facilities are available for small corporate events and celebrations, and all details are available by calling us at 888-224-5879. It is late Spring here at the winery. The vineyards and Olive Orchards have finished flowering and it looks to be a good size crop for both..
Dutch Henry Winery is located along the historic Silverado trail. Find us on the map. for special offers and releases. Wine club members automatically get 20% off on all purchases on Dutch Henry wine.